Blockworks will showcase the practical applications of Blockchain Technology transforming Business, Government and Society. From Supply-Chain to Smart-Cities, Digital Identity, Finance, Transport and Services. Blockworks brings together leaders from Business, Government and community organisations to learn about Blockchain technology from International experts, Industry leaders and Kiwi trailblazers. The 2018 Blockworks programme includes a Hackfest on October 6th and 7th at AUT, Workshops on October 11th and the full day conference on October 12th at the ASB Waterfront Theatre. Your Blockworks conference ticket provides you with all-day catering and in-theatre access for all talks and panel discussions. Blockworks talks will not be published online after the event. Your attendance is the only way to guarantee access to speaker presentations. Make sure you're following @BlockworksNZ on Twitter and Facebook to see and share the latest updates. Blockworks is proudly presented by Centrality, Microsoft, Cryptopia, IBM, Air New Zealand, NZ Blockchain Association, AUT, ATEED, NZTE, Storicom, and Idealog. 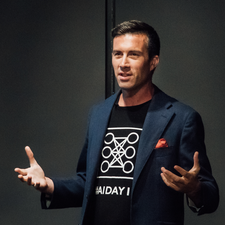 Founder of Tech Events company Tech.Kiwi and NewZealand.Ai which hosts The AI Show Monthly meet-ups and AI-DAY.co.nz, New Zealand's Premier AI Event.